Without taking much of your time, we would like to update you: CMS extends deadline for Medicare Eligible Professionals now have until 11:59 p.m. ET on March 20, 2015 to attest to Meaningful Use for the 2014 reporting year. This extension also allows EPs who have not already used their one “switch” – from Medicare to Medicaid, or vice versa – to do so before the same deadline, according to the Centers for Medicare & Medicaid Services. After that, they’ll no longer be able to switch programs. Please do NOT leave your incentives on the table; because more than that loss, the penalties will cost you more and forever! Note: The Medicare extension does not affect deadlines for the Medicaid EHR Incentive Program. 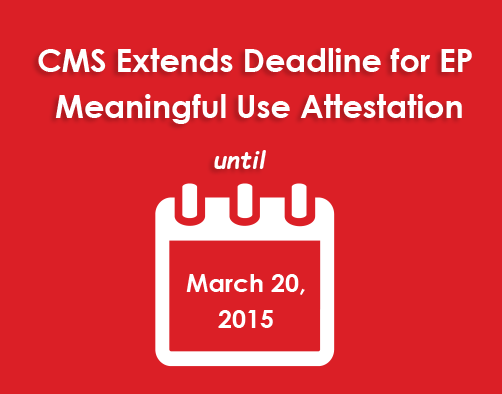 Additionally, the EHR reporting option for PQRS has been extended until March 20, 2015. You have already been using an excellent EHR and vendor who is willing to help you!